It feels as though Leap! (originally titled Ballerina, renamed for American audiences presumably out of fear of alienating boys, in a Disney-esque Rapunzel / Tangled or The Snow Queen / Frozen move) was conceived by picking a subject out of a hat and slotting it into a kid film template. “What dream haven’t we seen an animated movie protagonist follow yet?” Still, the filmmakers behind Leap! seemingly can’t picture a children’s movie without a cavalcade of unnecessary action scenes and fart jokes—and not good fart jokes at that. The result is a movie allegedly about ballet with weirdly few scenes featuring actual dancing. Félicie (voiced by Elle Fanning) and Victor (Nat Wolff, for some reason replacing Dane DeHaan from the European version) are best friends who escape their rural orphanage to pursue their dreams in 1880s Paris. 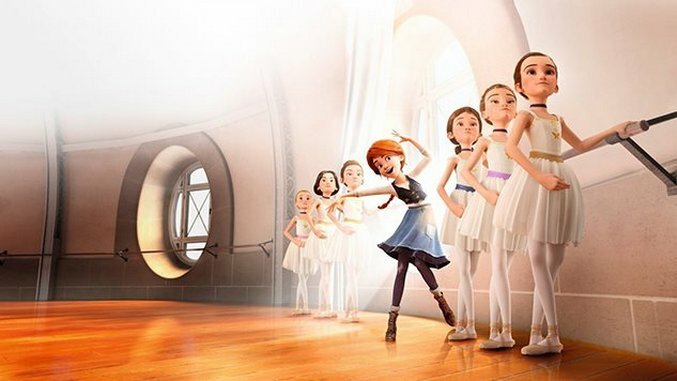 Victor, an aspiring inventor, goes to work for Gustave Eiffel, while Félicie, who wants to be a ballerina, tricks her way into the Paris Opera Ballet School. Drastically outclassed by her more experienced peers, Félicie gets lessons from former prima ballerina turned housemaid Odette (an extraordinarily flat Carly Rae Jepson) to keep up. The best dancer in the group will be featured in the ballet’s upcoming production of The Nutcracker, and Félicie’s chief rival is, of course, a snooty rich girl, Camille (Maddie Ziegler, known primarily as a dancer, but this is a cartoon, so…). While she experiences a stratospheric “leap” in ability over the course of like a week, Félicie naturally can’t hope to triumph unless she also figures out the vital question of why she dances, because, remember, heart is the most important thing of all. Leap! takes cues from sports movies more than anything else, what with its many sequences of training and practice. This at least lets the film stand out in a genre that has trouble thinking outside of the bounds of adventure plots—though, again, it still throws in a few flimsily justified chase scenes so as not to bore the kids. Yet the movie forgets that the point of training montages is to give a satisfying payoff in which the protagonist has mastered their art. The real dancing bits each last a minute or two, and there aren’t many of them, which is a shame, since they are the only moments in which Leap!’s animation becomes distinctive, paying attention to character movement and even realistic sound design. Technology has reached the point where lower-budgeted CGI films can at least look better than video games, but Leap! still suffers from stiff motion and muted facial expressions. Worse, it has terribly anonymous design, both in the many characters who basically look the same, and in that the film’s overall style bears no distinguishing features whatsoever. But then, this is a matter of trickle down ennui: If the higher-ups didn’t bother to do more than draw up a generic premise with all the expected beats, why should the animators be compelled to try? Why should anyone involved do more than the minimum? And why should any viewer care?